Yeah, you read right, it’s a portable baby incubator, and it has already saved infant lives, no joke. Sometimes you just have to take a step back and say, “Daaamn”, at what people have made possible, and the “Embrace Warmer” is absolutely no exception to this. The nonprofit organization Embrace Innovations is on a mission to change the statistics and the situation. According to their site, 98% of infant deaths occur in the developing world due primarily to complications like hypothermia, arising from premature birth and low birth weight. Many of these deaths are avoidable with the right care. We’re talking about over a million babies at risk here. In other words, we’re talking about saving a lot of lives that have just barely begun. Heavy, we know, but there’s something you can do to help as well, and we’ll get to that. But first, to the product, Batman! Your classical hospital incubators belong in hospitals and they are incredibly expensive to acquire and maintain. Beyond that, they require specialized knowledge to operate and a constant source of electricity to run. The existing alternatives are either also expensive, electricity dependent, inoperable without specialized knowledge, less effective, or simply unsafe. In many cases in the developing world in the face of a lack of facilities, equipment, and funding, they use what they can, what they have at hand, including hot coals, hot water bottles, and light bulbs. That’s where the baby Batsuit, er, the “Embrace Warmer” comes in. Originally designed by a team of four Stanford University MBA students some five years ago, one part is the body suit itself that the infant is strapped into. Another part is a heating unit that looks a bit like a thick flat-bed scanner. Then there’s the flexible body suit insert comprised of a grid-like collection of phase-change-material packets that, once it’s heated properly to operating temperature in the heating unit, gets transferred to a large flat compartment at the back of the body suit that the baby will be fit into. From there, the body suit with its heat-pad insert can provide incubation for up to six hours, completely cable and electricity free, completely mobile. And the mere mortal baby can be transformed into a recovering superhero. Incredible. While the heating unit does require an external source of electricity to function, it is only for the duration required to heat the phase-change-material insert (as little as 35 minutes) and it remains extremely transportable, especially when not in use. Technical specifications indicate that it can even run off a generator or any power source that can provide 230V AC, and there are plenty of portable power sources these days. Other advantages to the device as a whole include lower cost, easy cleaning of the body suit, and the reusability of the heat-pad insert (up to a prespecified extent). We can envision the device’s further use in humanitarian and environmental crisis situations, not just in the day-to-day of the developing world. The success stories so far? Parents gave birth to a low-birth-weight child in a taxi in Afghanistan and the “Embrace Warmer” enabled the hospital staff to safely begin stabilizing the baby right there in the taxi, then transport the baby inside, and then provide the baby enough time to begin gaining weight and modulate her own body temp. 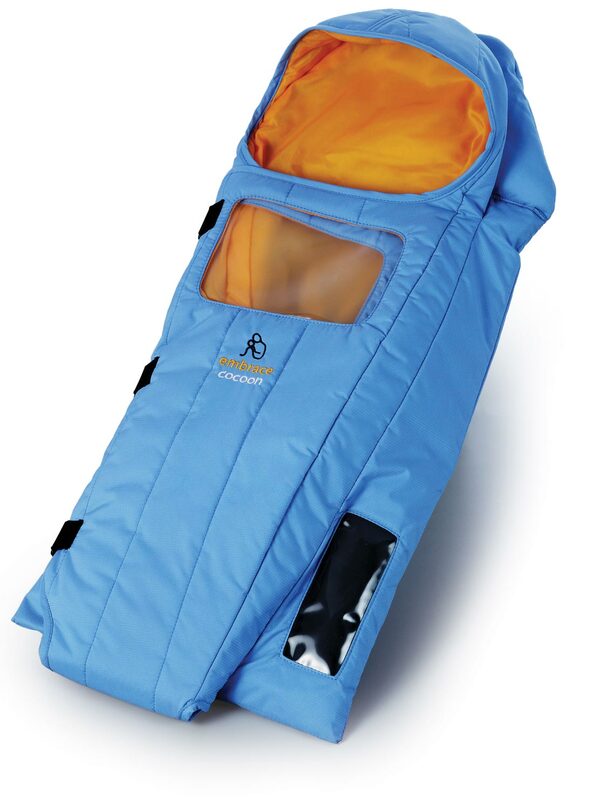 In Beijing, an orphanage was able to stabilize and keep alive a low-birth-weight infant discovered abandoned on the street utilizing the “Embrace Warmer” for thirty days. That child is now over two years old and lives with his adopted family in Chicago. We mentioned earlier that you can play a part in all of this. Through your tax-deductible monetary donations you can secure a child’s access to or a facility’s acquisition of an “Embrace Warmer”, staff training and support, education for mothers, and more. Your turn to be a superhero.